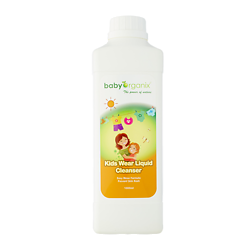 This biodegradable Kids Wear Liquid Cleanser is specially formulated to remove tought stains from clothes. The formula is phosphate-free, dye-free, and, hypo-allergenic which allows thorough rinses, leaving no residue on fabric. You can be res assured that this cleanser does its job effectively without the harsh detergents.